I can't believe that Easter is in a week and I haven't posted for over a month! Well, I have been neck deep in residencies at several schools but I finally have reached spring vacation time. Here is a new spring project. The inspiration came off of pintrest but there is no link just a picture. Thank-you whoever you are! I have changed it up and tested it with 2 classes of kinders. They turned out great so I thought I would pass it on to you. - brown, black, white, yellow, green, and orange paint. I used acrylic but you can use liquid tempera. 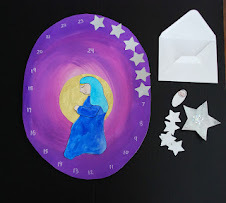 At school we used blue construction paper but it also looks great on painted blue paper. I gave the students some black and brown paint and had them paint the 4"x6" piece of paper. Using a pencil and end of a skewer I had them stamp dots all over the paper with white paint. Put the 4"x6" paper aside to dry. 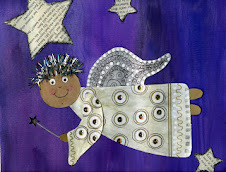 With the leftover white paint take a small piece of sponge and sponge on a few clouds on the blue paper. With a piece of corrugated cardboard dipped in green paint have the kids stamp on some grass. When the spotted paper is dry have the kids turn it over and draw a line from one corner to the other making a diagonal. Have them cut on this line. Glue one of the pieces on the paper just above the grass. This is the body of the mother hen. Cut a wing out of the other piece of paper. Glue into place on the body of the mother hen. I gave each group of kids 2 sponges. 1 large circle and 1 smaller one. 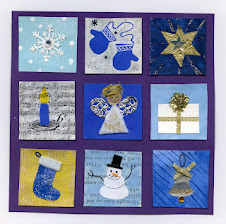 These are they same sponges I use for stamping snowman. The kids got to make 2 chicks but here I only added one. Stamp on the body and the head. 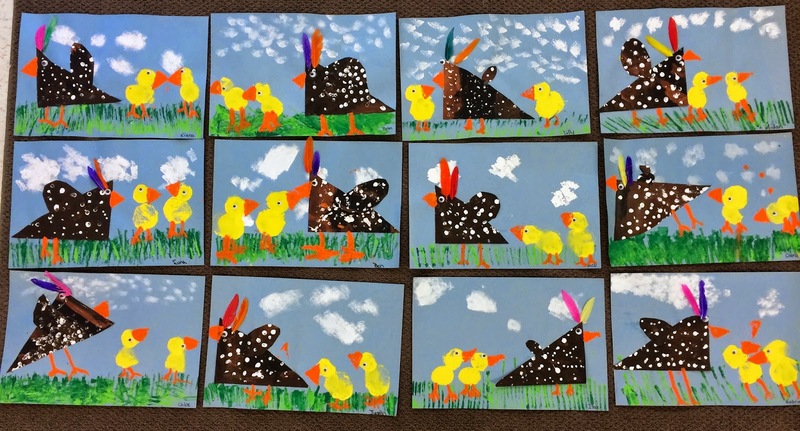 Using a triangular piece of sponge and orange paint we stamped on the beaks. Using a small paintbrush and that same orange paint we painted on some chicken legs. 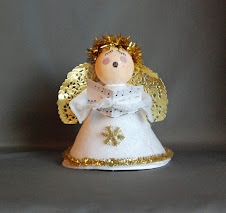 Glue on the googly eyes and then add a couple of feathers to the top of the mother hen's head. I cut the ends off so they would fit better. Here is some more recent student work. 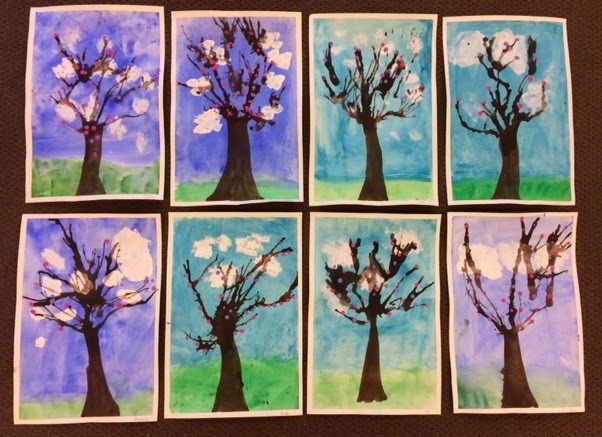 Some of the spring trees done by kindergarten. 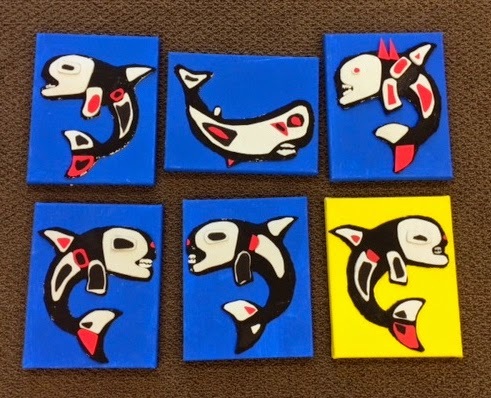 A few of Grade 4's Inuit whales. and some of their mixed media owls. 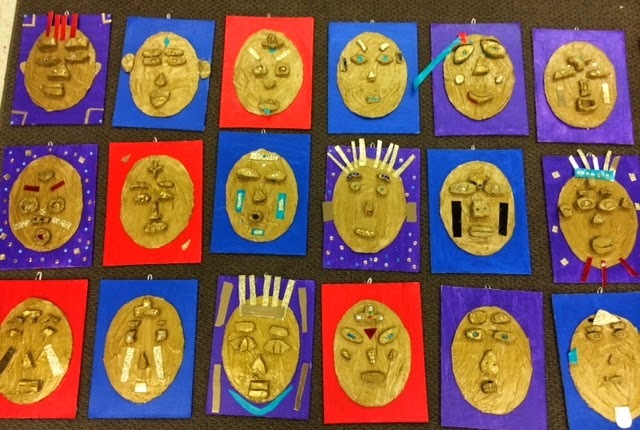 Grade 3's Peruvian masks. We made our pieces from air dry clay so a bit different from the original post. 1 month, 702 students, 27 classes, and 37 different projects by the time I was all done. I'm off to paint in Maui and will hopefully have some great photos for you next time. Take care everyone and Happy Easter! I just love your ideas! such wonderful things to make with the pupils.